The connections between organisational culture, leadership style, organisational learning and innovation capability. 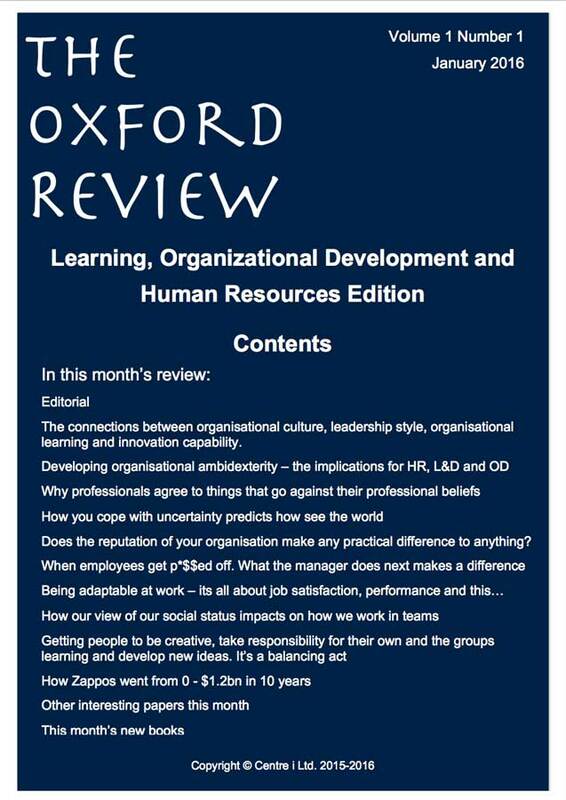 Developing organisational ambidexterity – the implications for HR, L&D and OD. Why professionals agree to things that go against their professional beliefs. Does the reputation of your organisation make any practical difference to anything? Getting people to be creative, take responsibility for their own and the groups learning and develop new ideas. It’s a balancing act. An interesting and fairly large-scale study that conducts a form of factor analysis called Structural Equation Modelling (SEM) on data from 398 organisations. and how they affect innovation capability and performance within organisations. There is significant evidence that professionals frequently give up their autonomy and professional values and beliefs in the face of conflict with management edict, bureaucracy, systems and organisational agendas. The question this paper attempts to answer is why they do this. Researchers looking at many issues from decision-making to anxiety are starting to focus on the intolerance of uncertainty as primary factor in how people see or interpret things. This study looks at how intolerance of uncertainty impacts our perceptions. An interesting study has just been published that looks at the effects of corporate reputation on the people who work inside the organisation and the organisation’s performance in the market. It is estimated that somewhere between 50 and 70% of employees, will, at some point in their employment feel that the organisation has wronged, mistreated or let them down in some way. This study looked at this issue, focusing particularly on the issue of employee dissent as a result of psychological contract breaches by organisations. An interesting study to find out what factors contribute to employee adaptability and ability to cope with change. A new study just published has shown that your social status and social group will predict how you interact with other people in a team often without knowing about it. In a paper published this month researchers from two business schools in France have looked at why some Communities of Practice are easier to get going than others, and why some groups will readily take control of their own community and self organise in order to learn together, and other groups find it harder or almost impossible to manage their own communities and keep the learning going. This study looked at Zappos to unpick what led to their meteoric success. Sales went from $8million to over $1billion in less than 8 years.